Dress Â– check. Veil Â– check. Shoes Â– check. Purse Â– check. YouÂ’ve found the perfect gown, veil and shoes but havenÂ’t found the perfect jewelry set – yet. Where should you begin? We can give you a few ideas to get you started. The current trend in bridal jewelry is antique, vintage, and big and bold. If you are lucky to have the perfect antique piece of jewelry from a relative that you positively love, your search may be over. Not sure? Spend some time with your mother, grandmother or other favorite older relative and see what type of jewelry they may have to lend you. If you find something you absolutely love, then you have just found the perfect bridal jewelry for your wedding day. Antique not quite your style? 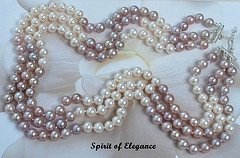 Rhinestone bridal jewelry is perfect for the Bling, Bling, big and bold look youÂ’re seeing on so many brides this year. Rhinestone jewelry sets have come a long way in terms of quality and design. Whatever your style is Â– contemporary, Art Deco, traditional or vintage, there is sure to be a rhinestone jewelry set that you will love. The great thing about many bridal jewelry sets is that you really can wear them again after the wedding Â– perfect for bridesmaid jewelry sets too. Crystal bridal jewelry sets are also another option to look at for this year. Beautiful Swarovski crystal necklace sets are available in an array of colors Â– one sure to match your wedding color. A trend weÂ’ve noticed is that the bridesmaids are wearing clear crystal while the bride is wearing a clear crystal necklace set intertwined with the wedding color to match the bridal party. This look is particularly stunning with the darker wedding colors such as chocolate, burgundy, and black. Of course classic jewelry pieces such as diamond studs, diamond teardrop pendants and diamond bracelets are always in vogue but if youÂ’re just starting out, you may not have collected these classic pieces yet. CZ designer inspired bridal jewelry is another option to take a look at and only you will know that your jewelry isnÂ’t the Â“realÂ” thing. The beautiful chandelier earrings, necklaces and art deco bracelets you see on the red carpet will look just as enticing on you on your wedding day. Choose whatever bridal jewelry look you like the best and you will feel as good as you look when you walk down that aisle! Denise Sanger is the owner of My-Wedding-Jewelry.com which has a diverse catalog of bridal jewelry and bridesmaid jewelry. We are located in Sunny North Florida. This entry was posted in Crystal Glitz and tagged crystal, dangle, jewelry, necklace, swarovski on July 3, 2009 by admin.